If you’re looking for a different take on the physics puzzle games that populate the App Store, give Monkey Bongo a fling. Unlike other apps where animals are launched through the air at selected targets, the animals remain stationary in Monkey Bongo; instead, you’re trying to get food over and around obstacles to their intended recipients. All of this happens with the kind of gorgeous multi-dimensional graphics that developer Pangea Software routinely delivers. You control a battalion of helpful monkeys who just want to fling bananas at their hungry toucan friends. Just drag back you finger from the monkey to fling an object in the opposite direction—a fairly intuitive way to control things. Unfortunately, the path to getting your banana from Point A to Point B isn’t always straightforward. A number of obstacles—crates, bales of hay, and other structures—stand in your way, so you’ve got to figure out a way to fling that banana to its toucan target. You’ve got coconuts and torches at your disposal to take out some obstacles, but it’s brainpower, not brute force, that will help you win the day. Banana-Rama: In the latter stages of Monkey Bongo, getting the banana to its toucan target can be a challenge. But fortunately, you’ve got coconuts, torches, and bongo drums to help you get past any obstacles in your way. The action in Monkey Bongo unfolds across five worlds, each with 10 levels of their own, so there’s an awful lot to play for. (A free lite version lets you play the first 10 levels to get a feel for the game.) Most of the puzzles also require a bit of thought to solve; you’ll really have to figure out how to get that banana to the waiting toucan on some of the more complex levels. You can also ramp up the difficulty by going to the game’s settings, and switching off the Easy mode—that turns off the arc that appears when you aim your throws, adding another level of challenge to Monkey Bongo. It makes the game appealing to both advanced players as well as novices. If you own an Apple TV as well as an iPad 2 or iPhone 4S, Monkey Bongo is appealing in another way—it supports the AirPlay mirroring features introduced in iOS 5, so you can play this graphically-rich game on your HD television set. Sadly, neither my iPad nor my iPhone are state of the art, so I was unable to test this feature on my Apple TV. You can work your way through Monkey Bongo’s 50 different levels, or you can go back to a completed level to try and improve upon your score by racking up more bonuses. That said, Monkey Bongo doesn’t do a very good job of celebrating when you’ve set a new mark. A splash screen for each of the five worlds displays your best score for each level, but should you manage to beat one of your scores, there’s no acknowledgement from the game. That hurts Monkey Bongo’s replayability. By default, the camera in Monkey Bongo will follow any object you throw, even if you horribly miss your target. If you find this as annoying as I did, you can thankfully turn off camera tracking in the game’s settings. Still, Monkey Bongo can occasionally zoom in a little tight on your monkey so that you can’t clearly see the target you’re trying to reach. Or, if you pull back a little too aggressively on your throws, the target can shift out of view. In either case, you’ll need to pinch to zoom out to get a better view of the action. Monkey Bongo’s few annoyances are fairly minor, though. This is a pretty engaging game, with a very distinctive look. 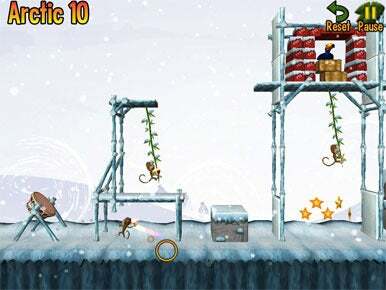 Physics puzzle enthusiasts should go bananas over Monkey Bongo’s intuitive controls, challenging levels, and whimsical graphics.